Smoothie bowls are the perfect solution for when you’re not a morning person. Having a healthy breakfast is very important as you’ll need energy to focus and get things done. But when you find it difficult to get up in the morning you’ll probably also find it difficult to eat breakfast as it can be a bit much to finish a sandwich or a bowl of cereals. 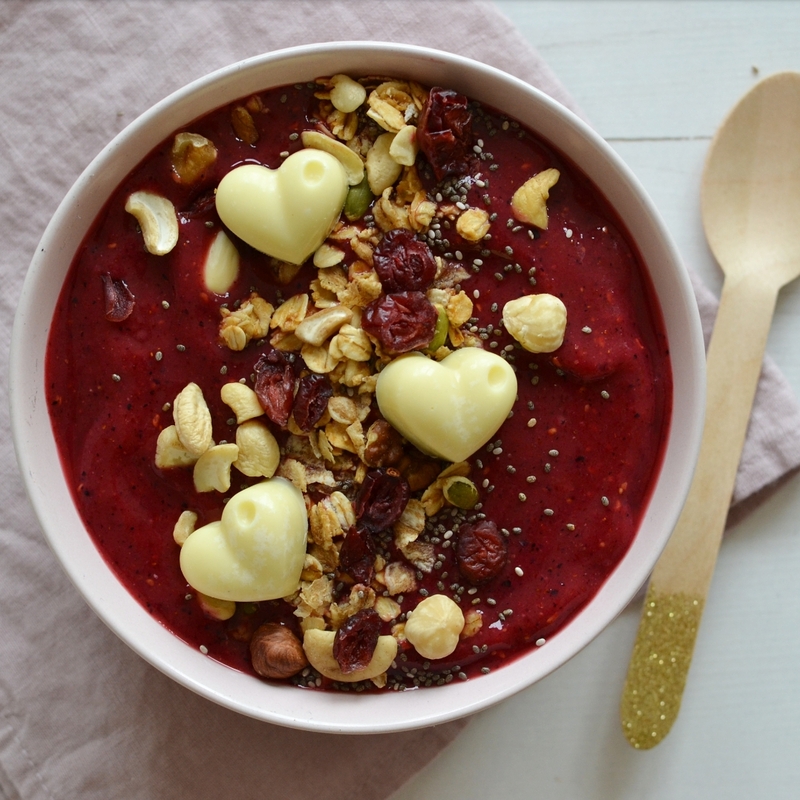 Smoothie bowls are your answer! They’re easy to make and they feel like you’re eating ice cream. And be honest, you’re probably always in the mood for ice cream! This time I made a cranberry smoothie bowl. Cranberries are high in antioxidants, high in fiber and very low in calories. I don’t only love them because of their sweet taste but also because of their rich color. 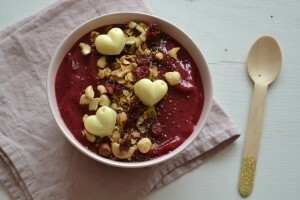 I made this cranberry smoothie bowl with the Byzoo vacuum blender Giraffe. A vacuum blender blends your fruit (or vegetables or nuts) in a vacuum. By removing the air before blending your fruit won’t change color or separate in your glass, so you get a beautiful, soft structure and bright colors. It also maximizes the nutritional value. With a normal blender most of the nutrients get lost in the blending process, by removing the air before you start you don’t get the reaction with oxygen that you’d normally get. Put it all in a blender, preferably a vacuum blender. Pour the cranberry smoothie in a bowl and top it with your favorite toppings. I used granola, chia seeds, nuts and dried cranberries. And I topped it off with some white chocolate hearts (Eating vegan? Make sure to get vegan white chocolate).